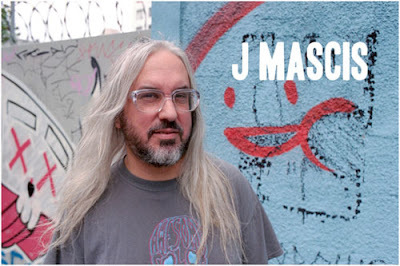 The big deal with J. Mascis' upcoming album, Several Shades Of Why, is that it's his first solo album. I like the single a lot: quintessential Mascis, acoustic and reserved without sounding diluted or tired. Free download MP3 of "Not Enough"
Recorded at Amherst Massachusetts’ Bisquiteen Studios, Several Shades… is nearly all acoustic and was created with the help of a few friends. Notable amongst them are Kurt Vile, Sophie Trudeau (A Silver Mount Zion), Kurt Fedora (long-time collusionist), Kevin Drew (Broken Social Scene), Ben Bridwell (Band of Horses), Pall Jenkins (Black Heart Procession), Matt Valentine (The Golden Road), and Suzanne Thorpe (Wounded Knees). Together in small mutable groupings, they conjure up classic sounds ranging from English-tinged folk to drifty, West Coast-style singer/songwriterism. But every track, every note even, bears that distinct Mascis watermark, both in the shape of the tunes and the glorious rasp of the vocals. Ten brilliant tunes that quietly grow and expand until they fill your brain with the purest pleasure.